SANAA, March 30 (Xinhua) — Tens of thousands of anti-government protesters in the Yemeni capital of Sanaa vowed on Wednesday to storm the Presidential Palace on Friday if President Ali Abdullah Saleh refuses to leave soon. “Enough! 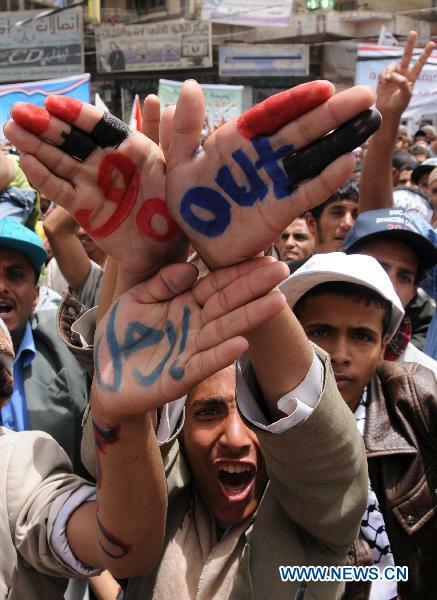 Enough!” angry youth-led street protesters shouted, waving their hands towards the Presidential Palace. The crowds went out from their tents outside Sanaa University and marched along roads leading to the Presidential Palace for the first time in six weeks, aiming at urging Saleh to leave office immediately. Sources from both the ruling party and the opposition said Saleh and opposition leaders were continuing talks to seek a dignified end for the president. Most of Saleh’s demands were to ensure a decent life for his family and a guarantee that none of his family members will be prosecuted after his departure, which were considered as tough tasks by the opposition, especially after hundreds of thousands of protesters called for prosecuting Saleh and his family for alleged “massacre”. The protest organizers told Xinhua that if Saleh dose not leave by Thursday, Friday will be “the Day of Liberation” as one million protesters will stage a march to Saleh’s palace.